You might not know us, but you do. We designed and engineered OOBI appliances that are deployed in the world’s largest data centers. We are a group of technologists with more than 100+ years of cumulative experience in the remote console management business, with many patents granted. Now we’re putting our century of experience to work to make your job even easier. Welcome to the simpler, faster, more cost effective software-defined future of IT Infrastructure Management. Did you know that the team who brought you the world’s first Linux Break safe Console Servers, coded the firmware for Rack PDUs and put IPMI inside of big name servers, is now delivering a Vendor Neutral software solution to access and control both Physical and Virtual IT assets? It’s true. 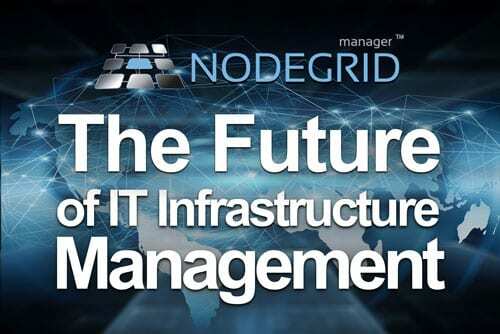 NodeGrid Manager is the industry’s first and only pure software solution on the market today that allows you to access and control Servers, Networks, Storage, Virtual Machines, Rack PDUs, UPSs and more from a single interface without the addition of any hardware appliances, while taking advantage of your existing infrastructure. NodeGrid customers are reducing the number of management tools they need to buy, learn, use, and maintain. You too can save time responding to outages faster, helping to improve service levels. Save money on training and maintenance costs associated with vendor specific management tools. These are just a few of the many benefits NodeGrid provides. NodeGrid takes advantage of your existing access and control hardware and supplements data center visualization and monitoring tools. Ready to take your infrastructure management to the next level? Schedule a live online demo of NodeGrid to learn how we’re changing the way physical and virtual infrastructures can, and should be managed, now and in the future. Thanks in advance for joining us on this exciting journey into the future of software-defined infrastructure. We look forward to hearing from you. Share the post "The Future of IT Infrastructure Management is Here"